I’ve been wanting—note I didn’t say “need” or any derivative thereof—a table saw for quite some time and when I saw this one, originally a Black Friday special, still available a few weeks after the Thanksgiving holiday and with an assortment of store credits and a Harbor Freight coupon in my pocket, I decided the $50 out-of-pocket outlay was worth it, especially with the lifetime warranty. Finally found one in stock, ran out to get it and after a good week or so of getting to know it, here are a few quick thoughts. As always, I’ll follow up further down the road with more detailed information. It’s a well-built, sturdy unit despite it’s light weight and portability. The unit does have wheels and a retractable handle, and like most saws of this genre, you can stow all the accessories right on the saw. Pretty basic stuff, right? Table—I’m not working on the most level of surfaces (do the best I can to even things out) but the table itself is good. I’m pretty sure its aluminum but not 100 percent sure. It extends out—to the right—leaving some nice room to work. Fence—Here’s where I’m frustrated. Ridgid has a “dual-locking rip fence” that is fairly high and rather thick; it’s well-made, but in terms of accuracy … there’s a little left to be desired. I’ve tweaked and tinkered and no matter what, I can’t get the front and back to line true; they’re always between 1/8th and 1/16th of an inch off. I’ve done a little research and found that this has been a bit of a common problem but maybe somebody with a little more experience than myself—and a better grasp of math and patience—will have better luck. Miscellaneous: Could use a longer cord … dust collection port a little too loose for 2.5” shopvac hose … the miter guide is very strong and accurate … not as loud as I had expected. It’s not quiet by any means, but not ear-shattering … blade changes are kind of a pain … Sliding the extension table should be done with care. If the saw isn’t “locked down,” it’ll slide. Don’t ask how I found that out. For now, I’ll leave it at this: it’s a good saw at a good price. If you’re like me, and plan to only use it occasionally for random projects and are still getting to know the finer points of woodworking, you’ll find it does the job adequately. The fence is frustrating, but not a deal-breaker if you know what you’re doing. I’m contemplating returning it as Home Depot still has a DeWalt compact model sitting pretty at $225. If I can get them to again honor a Harbor Freight coupon … I’m going to jump on it, if only for the rack-and-pinion fence. But if that wasn’t an option, I’d still be just fine with this model. Practice makes perfect. I’ll follow up in a few weeks—weather permitting—with more thoughts. PS—Took a few pictures on my phone to post, but at the moment .. the phone is being a jerk. Will update photos tonight. Im actually in the same boat as you. wanted one, bought this one a few weeks ago. I put a Diablo 60t on it and it works nicely for what it is. the fence is definitely the weak point but workable. i have been working on a few picture frames for xmas with it and if it werent for my menards bought mahogany having a little warp to it, they would be perfect. 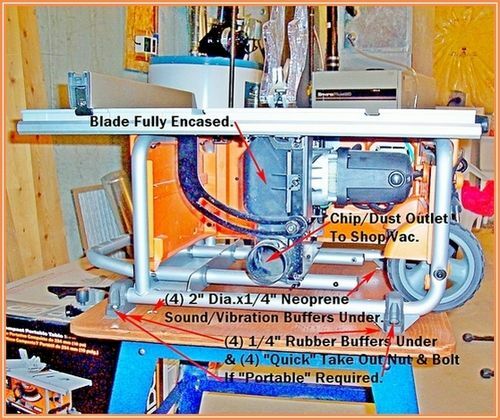 a planer… someday. The Ridgid fence is terrible I have used the bosch and dewalt saws and the dewalt is definitely the best of the three. I don’t understand why the other companies don’t change their designs. That’s EXACTLY what I have been doing with my saw so far. I think I’m jumping to the DeWalt tomorrow. The Ridgid fence is terrible I have used the bosch and dewalt saws and the dewalt is definitely the best of the three. I don t understand why the other companies don t change their designs. I’m fairly sure Dewalt has their fence design patented in some way. It is a major selling point and the reason I went with a Dewalt saw for my jobsite saw. That s EXACTLY what I have been doing with my saw so far. I think I m jumping to the DeWalt tomorrow. I was at Home Depot tonight, and I’m fairly sure the Dewalt saw that’s on sale for $230 is the older generation DW745. I’ve seen plenty of them in the store over the last week, i just never see the actual model out on the floor. I’m sure it’s an older-generation, in fact from what I understood from the ToolGuyd’s write-up, it almost assuredly is, but in the limited window I have to work, I don’t want to spend a big chunk of it aligning the fence each time. My woodworking consigliere is coming by in the morning; I’ll check with him. I bought the DW745 last year when it was at that lower price and I love it. Cuts great and the fence seems pretty solid, none of that deflection you usually get when you lock a fence down. I ended up buying the Dewalt rolling stand for it too. As an FYI, the older DW745 has a rip limit of 24 inches – I think the newer version goes beyond that by and inch or so and I believe that’s really the only difference. I’m never using my saw to rip a sheet of plywood so it’s no issue to me and the older model at $230 is still a bargain. I did some tweaking today and got a little better results, but it really is quite a pain to have to do that every single time I move the fence. Haven’t had a chance to get to HD yet, but hopefully this weekend. As an FYI, the older DW745 has a rip limit of 24 inches – I think the newer version goes beyond that by and inch or so and I believe that s really the only difference. I m never using my saw to rip a sheet of plywood so it s no issue to me and the older model at $230 is still a bargain. The DWE7480 still has a rip capacity of 24 inches. It’s bigger brother, the DWE7490X and DWE7491RS/DWE7499GD have a rip capacity of 28” and 32” respectively. That’s a lot better than my first “table saw”. Mine was a cheap off brand table top model with a 10 inch blade and the fence was bent sheet metal, try to get an accurate cut with one of those. As far as cutting any hardwood, forget it, you could make a cut quicker with a bicycle sprocket on a hand mixer from the kitchen. 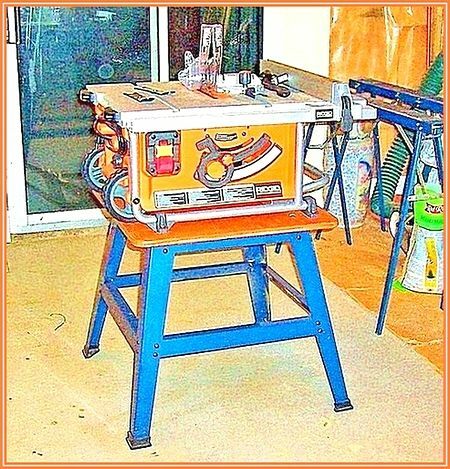 Now I have an older Delta Table saw, I got it second hand from a guy who was upgrading to a bigger model. Man, I never knew how a good a good working table saw could be. I have made some modifications to extend the table about 12” and since replacement inserts are no longer available along with most parts, I have to make do. I thought I had burned out the motor a couple years back and was able to find a new one, but discovered it was only the drive belt, oh well, I still have a new motor if this one ever goes out. Anyway, the saw was 10 or 15 years old when I got it. I’ve been using it now for 15 or more. I forgot to replace the screws in the insert one day and the worst thing happened that can happen to an insert. The blade caught it and it was no longer usable, neither was the blade. So be sure you replace those screws when you change those blades. I made a new aluminum insert that allows me to change the inserts in the insert for dado cuts, now only use zero clearance inserts except when I am using the blade tilted. Good luck with that saw, a friend of mine has one and he likes it. I’m still using the Ridgid. None of the nearby Home Depots will accept the HF coupon, so I’m just making do. And slowly but surely, I’m getting the hang of adjusting on the fly. I’m sure I’ll figure out a more permanent fix somewhere down the road. I’ve had this saw for 2 years now. I’m very Pleased with it. My Fence is a bang on after I made a few adjustments. It locks straight all the time now. It still has the same blade on it and will rip a 2”x whatever, full length without any problem. Guess I’m an “Old School Carpenter” but I always measure the inside back saw blade tooth and the front inside tooth distance to the fence and 99.9% of the time it’s dead on. My suggestion to you would be to flip the fence over and play around with the adjustment under there. There are quite a few of them, Front & Back I think your back “Arm” (#28) that locks to the table is not lined up properly, that’s why it’s out of alignment. I cut that section out of my Manual. It’s as below. Also how I mounted it to my existing Steel Legs to make it Quieter, less vibration with isolators, and kept the “Portability” if needed. ” Sliding the extension table should be done with care. If the saw isn’t “locked down,” it’ll slide.” I’ll assume you mean the table extension will slide if it’s not locked back down? No! I won’t ask how you found that out! Because if you didn’t DUH!!...LOL.. My 2.5” shop vac also fits perfectly in the Dust Port that completely surrounds the blade, any tighter and I wouldn’t be able to get it in. Unless you’ve got a long distance to go to plug it in why is the Cord to short? Mine’s just fine or I’d use an extension cord if I needed more length. I’m sure you’ll get to like it after you’ve used it for a while and made a few adjustments. 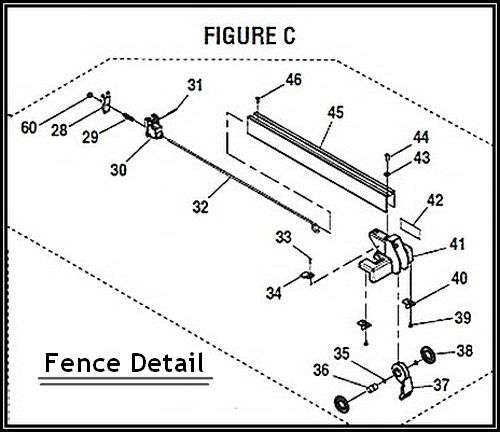 I m fairly sure Dewalt has their fence design patented in some way. It is a major selling point and the reason I went with a Dewalt saw for my jobsite saw. I was at Home Depot tonight, and I m fairly sure the Dewalt saw that s on sale for $230 is the older generation DW745. I have the GTS1031 by Bosch and it is an awesome saw. Fence works great and, best of all, all the accessories store right on the saw. Plenty of power, and even the blade that came with the saw is pretty good. Couldn’t be happier.